Several of us piled in Rose Corser’s Land Rover and were dropped of at the school in Taiohae, where we soon found the principal’s office. I was pressed into service as interpreter since the principal did not speak English. We were directed to one of the classes, where Tom Nolan and Tetsuro Isono made a short presentation to the students. “Le professeur” explained a little about the mission of the KA’IMIMOANA, and I was able to understand a quite bit of what he said. Except for the language being French, I would have thought I was in a classroom in Hawaii. The students then came outside with us and sang to us in the Marquesan language. With the bay in the background, the KA moored in the harbor, it was one of those “island moments.” Our objective today was definitely one of diplomacy and good will. 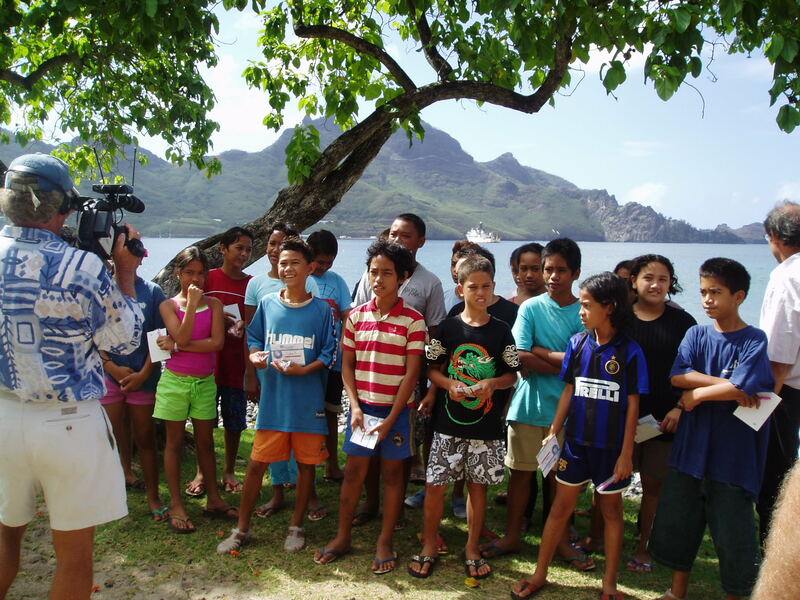 Students from the school in Taiohae sing in the Marquesan language. Our next stop was the Mayor’s office where there was to be a presentation from the KA’IMIMOANA to the VIP’s of Nuku Hiva. The current mayor of Nuku Hiva was there, along with the past 2 mayors, the island Chief, the head of the Gendarmerie (Police) and the French representative for Nuku Hiva. Captain Mark Ablondi presented them with an enlarged satellite photo of Nuku Hiva. Many speeches were made, expressing appreciation for the collaborative work of all the parties in the effort to better understand the world’s oceans. It was now time to take the water taxi out to the KA’IMIMOANA for the tour given to the VIP’s. This was my first time on board the ship, in fact, my first time on board any ship! I joined in the VIP tour of what would be my floating home for the next 2 weeks. The VIP tour of NOAA Ship KA’IMIMOANA. After lunch on board, a class of students from the school joined us and I enjoyed trying out my French with them, and just generally enjoying being around the kids. By the time they served ice cream in the mess, several of the crew on board had become celebrities, signing autographs and the subject of many 14 year old girls’ giggles. For the last night on Nuku Hiva almost the entire crew went out for pizza after saying our goodbyes to Rose and Diana, the manager of The Pearl. It was nearly eleven by the time we took the water taxi to the ship, and I was shown to my stateroom. Tetsuro had flown back to the States, and I was taking over his berth on the ship. I must admit that my few hours on board earlier in the day had given me a bit of a queasy stomach, so I regretfully swallowed some dramamine before turning the lights out. We would get underway in the morning continuing the work of the KA’IMIMOANA near the equator. Bon nuit and au revoir Nuku Hiva! 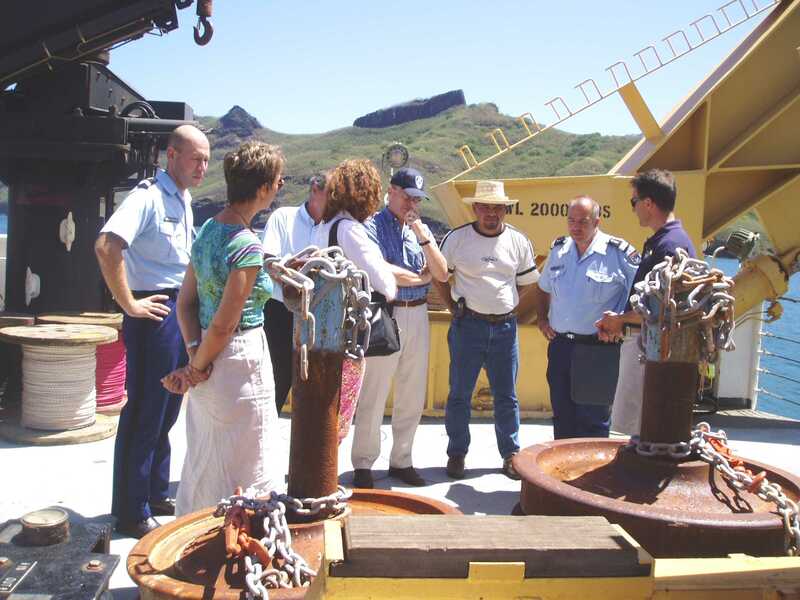 This entry was posted in 2003, Nancy Lewis, NOAA Teacher at Sea and tagged diplomacy, French Polynesia, noaa ship ka'imimoana, Nuka Hiva, VIP tour. Bookmark the permalink.